In Act II of Harold Pinter's The Birthday Party, in the midst of the long awaited eponymous festivities, there is a chilling birthday toast. The speaker, Goldberg, is a supremely Pinteresque comedian of menace: hyper-articulate, charming, yet without any trace of what would commonly be called a soul. His identity and purpose in the world of the play is frustratingly indeterminate. Pinter enjoys giving him a dose of his native Jewish-Cockney East End, but for all we know, it could be an act. We are even given three different possibilities for his first name. GOLDBERG. ...(Taking the stage.) Well, I want to say first that I've never been so touched to the heart as by the toast we've just heard. How often, in this day and age, do you come across real, true warmth? Once in a lifetime. Until a few minutes ago, ladies and gentlemen, I, like all of you, was asking the same question. What's happened to the love, the bonhomie, the unashamed expression of affection of the day before yesterday, that our mums taught us in the nursery? To take a leap into Pinter's more political dimension, this is the sentimentality of a fascist. We know by the end that these touchy-feely phrases come from the mouth of a gangster and a torturer. Your irony alert quickly goes on whenever a Pinter character utters words like "warmth" and "affection." In his world, never trust a man hiding behind purple prose. The moment is made all the more purple in the sublimely dandified and delicate embodiment of Goldberg by the great Allan Corduner in a formidable production of this early Pinter masterpiece by Emily Mann at her McCarter Theatre in Princeton. Corduner, a veteran London stage actor and frequent collaborator with Mike Leigh, is a real casting coup and is giving a performance well worth a ride on New Jersey Transit. In fact, I'd venture that the entire Act III of this production makes for the most intense 35 minutes of theatre you're likely to see in the whole greater metropolitan area this fall. Mann and her cast present a compellingly unforced and clear reading of a tricky play that is not necessarily a natural fit for Americans. Part of Mann's success is due to finding with her designers an almost timeless setting for this amazingly fresh 1958 script. Jennifer von Mayrhauser's costumes avoid nostalgic Brighton tackiness in favor of a more late-century sensibility which stays true to the characters even if it bends the period. The henchman McCann's leather jacket and the mini-skirt on Stanley's would-be girlfriend Lulu might not be authentic but ground the play in a recognizable lower class reality. And for Corduner's Goldberg, gone is the standard-issue hitman's black suit in favor of Saville Row blues and yellows and an elegant trimmed goatee. Just like his vulgar-accented fine phrases, Goldberg's appearance marks him as an enterprising climber, not just an mystical source of evil. My only major problem with the production was Eugene Lee's huge and excessively live-in-able set. The stage of the McCarter's Berlind space might be cavernous, but handing the assignment to Lee (famous for his astounding lavish constructions for Ragtime, Hal Prince's Candide, and Saturday Night Live!) is not a way to make it seem smaller. The rooming house is supposed to be the dingiest of "digs"--apparently modeled on a cheap place Pinter had to stay in as a starving actor on tour. Lee's structure is cluttered and dusty, alright. But its cavernous kitchen, and airy living room don't exactly provide the necessary claustrophobia of Pinter's nightmare scenario. It's even a two-level job, though I suppose getting a glimpse of our mystery men on the upper landing sometimes does effectively add to the overall paranoia. Bryne, incidentally, is essential to the production's success. She seems the genuine article as the batty old mum figure who dotes on Stanley. But obviously it involves much craft from this seasoned veteran. Randall Newsome makes for a unusually hulking and hunky McCann. In casting him, Mann seems to have intended something of a Laurel-and-Hardy pairing with Corduner's slighter Goldberg--the opposite of what productions might usually go for, but effective. They're brains and brawn personified. This early work, Pinter's first full-length, holds up mightily well, and still holds the potential to deeply disturb. Its central scene of torture--where Goldberg and McCann take breaks between blows to pepper Stanley with a barrage of nonsequitors--no longer seems abstractly interesting as "Theatre of the Absurd," but straight out of the Bush Army Field Manual. (You expect them to start playing bad loud music next.) In the final moments, the two thugs walk their silenced and transformed victim out the door, loading him into a van to a secret-site, where his medical needs, we're assured, will be tended to by "Monty." "Don't let them tell you what to do," the powerless Petey shouts after Stanley. But it's too late. Petey and the clueless Meg sit down to breakfast as usual and patter on, as conformity, intimidation, and force win the day again. 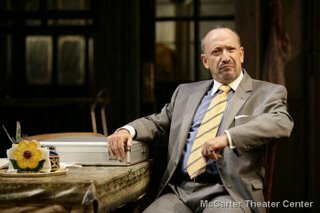 Many thanks for the most in-depth, thought-provoking review of McCarter's show thus far! You really hit the nail on the head with your review, particularly with your summation at the end.